Maybe, the transport in Paraguay has some rules. But it lasted a long time for me to recognize, if in this beautiful country the cars go on the right-hand or on the left-hand side. The pedestrians have no rights. As regards to the cars, the priority is a problem of discussion or it depends on the size of the car. Everywhere the lapacho trees were in blossom. Mostly they are pink, but they can be yellow or white. Local inhabitants are proud of this trees, everybody shows them to foreigners. It looks like some kind of deviation. Though it is hot during the day, the inhabitants clothe trousers and never shorts. The shorts are used only by foreigners. In the city does not exist a network of letter boxes. You can buy a postcard, but it must be sent from the post office. The bargaining with venders is very common. Jacob bought waterproof titanium watches for only 5 USD and two beers. After first swimming he gained a water level for more an may be the watches could serve like a fountain. Paraguay is a sparsely settled country. 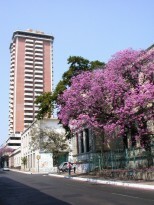 The most of the people live in Asuncion, over 600 000. On the contrary, the Chaco plain, which is three times bigger than the Czech republic, is almost unsettled. The people speak mostly Spanish or native languages. Nearly no one speaks English. The most typical animal is a cow. The cow population is twice bigger than the human one in Paraguay. In Chaco the ratio is even one inhabitant per 20 cows. The favorite meal is an underdone bloody steak. For most of the population it is the only one meal they can afford. Meat, meat, meat. In store you can buy meat for the price less than for 4 toilet papers rolls. In Paraguay you can buy two beers for one dollar. It is said, that indigenes have one dollar for the whole day nourishment. The street-girl costs also one dollar, but the natives said that it is hazardous. You could end up as an astronomer looking on the stars without the telescope. In the whole Paraguay the railway transport nowadays does not exist. But a long time ago the trains were a common means of transportation. Now the track is cast in asphalt. There is a museum instead of the main railway station in which one can see the first locomotive going through the South America and the president's train from the beginning of the railway transport. The crucial instance in Paraguayan history was the proclamation of independence in 1811 following by two absolute dictatorships, and two bloody wars. The first, beforehand lost ruinous war, led Francisco Lopez against an alliance of three neighboring countries during period 1865-1870. During the war half of the population had been killed, only women and children remained in the country (the ratio was 25 women per one man). The lack of male population had solved Spanish incomers. The second was the Chaco war during period 1932-1935. This war was won by Paraguay after serious losses. After the war Paraguay was given about three-fourths of the disputed area. 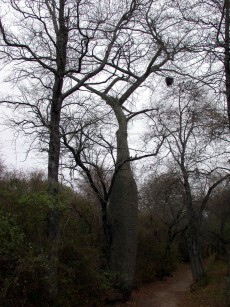 The Chaco or Grand Chaco is a low, flat, alluvial plain located north of Asuncion. It is immense, huge and sparsely settled plain. The one hectare of soil can be bought for only three dollars here. The native Indians had an interesting custom earlier: The caught pale-face was not eaten immediately. He was fattened firstly and offered Indian women. As lately as the first child of him was born, he was roasted and eaten up. Isn't it an interesting way of civilization evolution? Everywhere in Asuncion there are phone cabins or rooms in which an attendant is present. You can call from several kiosks and the price is seen on a display. A call to the Czech Republic for blockage of the stolen credit card cost about 12 000 Guarani (2 US dollars). The Paraguayan-Brazilian border was completely free and unguarded. The Paraguayan-Argentina border was a place with common check-in typical for southern countries. We wasted there only about one hour. But the border between Argentina and Chile is worth seeing. Between the Argentina and Chile check-in points is roughly 100 kilometers of Atacama desert. 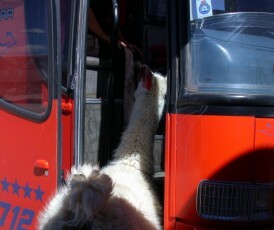 There was a lama on the Argentinean side, which went to every bus crossing the border. On the contrary on the Chilean side the customs officers have a panic from diseases coming over the Andes. We had to go through a special mat impregnated by some kind of chemicals and a boy sprayed both the wheels and the inside of the bus by disinfection solution. You are strictly prohibited to have any food and the inspection is radical. The customs officers even insufflated Charles flute. We had a bad luck in Chilean Antofagasta. It was a holyday and all the banks were closed. In the biggest hotel the money exchange was possible but they had not have a sufficient amount of money. A taxi driver told us that it is possible to change money at the confectioner's. And really! In the middle of the confectioner's was a glassed-in cabin, in which an attendance changed all kinds of money. We had seen lamas on the traffic signs very often. 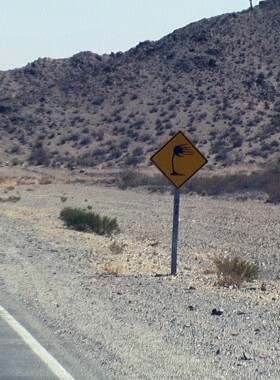 Once we saw a sign with bended cactus. Probably it stood for: Caution! Wind! The hitch-hiking we had tried in Chile only. According to the Lonely Planet guide the hitch-hiking ought to be without problems there. But this was not our case. After six hours of hitch-hiking we gave up and went by regular bus. Only two of us succeeded. The next day it was the same. The only one result was charred skin from the sun. During the last hitch hiking we have stopped after five hours of waiting a car with an opened bed in which Charles spent next four chilly hours. The whole result: hitch-hiking in Chile is a great misery and I would not recommend it to anybody.